Current theory about savant syndrome is that when part of the brain’s left hemisphere (language, comprehension, and logical thinking) is damaged, areas of the right (creativity, art and music) attempt to compensate, possibly even overdeveloping the brain’s nerve cells. We are not born with ‘blank slates’ for brains but come prewired, and lose some of that literally inborn knowledge as we mature and learn. As Treffert explains, math geniuses and savants, such as the ones who can easily and quickly tell you on which day of the week April 30 in the year 20,304 falls, actually use a preconscious process with more primitive brain circuitry; the rest of us routinely use left-brain higher-level circuitry. It’s as though the savant (and some geniuses) comes preprogrammed with a math module — a more instinctual part of the brain. That ‘module’ may work like ‘parallel computing’ — many concurrent computations making finding the answer lightning fast, as opposed to sequential, logical computing. One of the savant artists mentioned in the “On Wisconsin” article is George Widener, who was born in Cincinnati, Ohio in 1962. George has drawn all his life and his early artwork was of a more stereotyped savant style, a sort of recording of something he was looking at or had seen in the past. He drew landscapes and portraits. His very talented draughtsmanship gives him a range of technical abilities. He has had to work to overcome his literal nature and visual memory to create original artwork. George’s emergence as an expressive, original artist came as he began to place his revered numbers, calculations, calendars, facts, machine parts, and letters into works on found paper, often napkins. One of Widener’s “satellite maps” (or a map to hell) is at the top of this blog entry, with a link to others in the series. 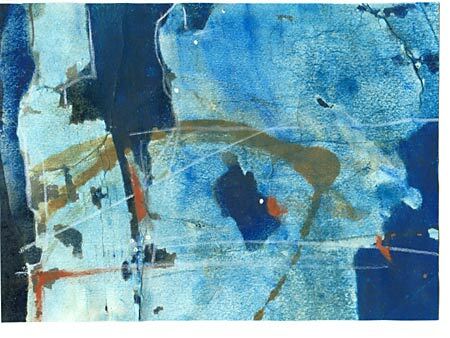 The satellite maps seem to be the most abstract of his work. I could not find a description as to the medium or size of these pieces. 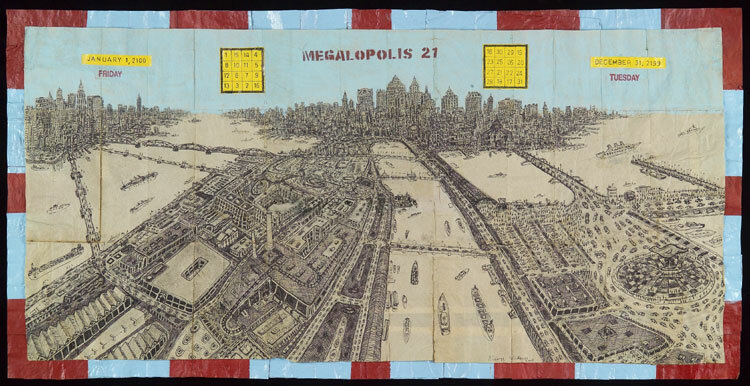 The megalopolis drawings showcase his prodigious drawing talent. 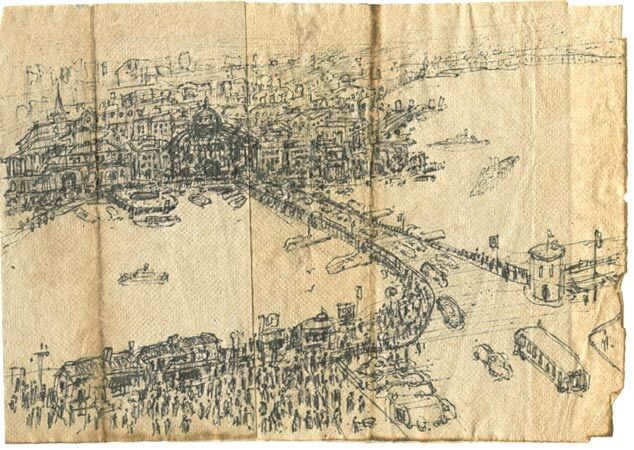 Two of his landscapes, “Untitled 1” and “Megalopolis 21”, are below; he apparently often uses ink on found paper such as napkins. The calendar and machine parts series may be interesting, involving his obvious fascination with numbers, but I question whether they should be classified as “art”. Mathematical artifacts, perhaps? 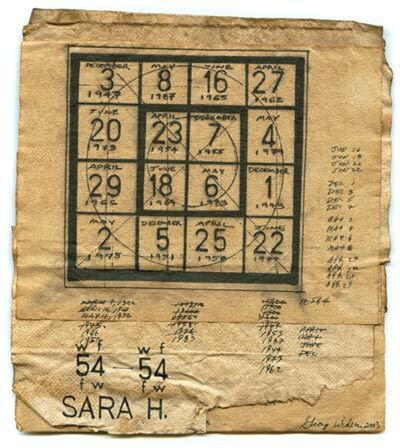 A description of his unique blending of calendar dates with magic squares is at the bottom of this web page. “Portrait of Sarah” is below. Thanks for posting this. Utterly fascinating. I would definitely categorize his calendars and machinery pieces as art–very thought-provoking and obsessive in their detail. The whole subject of savants is really interesting to me–so inexplicable-the damage to left brain may be a cause, but it certainly does not, to me, explain such ability as a result. It seems nearly miraculous. Wow, Eileen. This is fascinating. The abstraction of Map 3 and the Calendar with the non-sequential writing are brilliant pieces. Thanks for bringing this to our attention. I’ll be looking for that documentary.